The Rangers and Canadiens will square off in New York for the first time since Game 6 of the Eastern Conference Finals. Photo courtesy of the New York Rangers. After Friday’s game against the Sabres was postponed, the Rangers (8-7-4) were able to get a long rest as they prepared to face off against the best team in the Eastern Conference; the Montreal Canadiens (16-5-1). The last time that the Rangers met the Canadiens at Madison Square Garden, the Rangers went on to win Game 6 of the Eastern Conference Finals and advance to play for the Stanley Cup. The Rangers and Canadiens have played once this season, with Montreal coming away with a 3-1 victory. Carl Hagelin scored the lone goal for the Rangers, assisted by Anthony Duclair and Dan Girardi. The Rangers last game came on Wednesday, where they defeated the Philadelphia Flyers by a score of 2-0, with Kevin Klein and Rick Nash scoring for New York, while Cam Talbot earned his first win of the season with a 31 save shutout. It was a much needed win for the Rangers, as they had just come off of a three game losing streak, including a 5-1 loss to the Lightning at home. The Rangers have earned at least a point in 11 of their last 15 games (7-4-4), including nine of their last 11 home games (6-2-3). They have also scored a power play goal in three consecutive games, the first time that has happened all season. Rick Nash scored on the power play for the Rangers in the victory over the Flyers, making it three straight games for New York. Photo courtesy of MSG Photos. The Canadiens are a top 15 penalty kill team, which could present a problem for the Rangers and their special teams unit. Surprisingly, the Canadiens are 26th in the league on the power play, with just a 12.9 percent efficiency (8-62). Henrik Lundqvist will be back in net for the Rangers following a long period of rest for him. Lundqvist has started 15 of New Yorks 19 games this season, posting a 7-5-3 record with a 2.68 GAA and a .910 save percentage. Martin St. Louis is riding a three game point streak (2-1-3), and has nine points in his last nine games (6-3-9). The shift back to the right wing has been good for St. Louis, and he will play that position on the second line alongside Derek Stepan and Chris Kreider. Martin St. Louis will carry his three game point streak into tonight’s game against the Canadiens. St. Louis is second on the team in points with 15 (7-8-15) and has nine points in his last nine games. Photo courtesy of MSG Photos. Rick Nash has also been fantastic, and is off to a blazing start this year, picking up 20 points in the Rangers 19 games (13-7-20). Nash has carried New York’s offense for most of the season, and he is looking to contribute yet again tonight. However, one of the best Rangers recently has been Derek Stepan. Since returning from his preseason injury, Stepan has six points (1-5-6) in seven games. 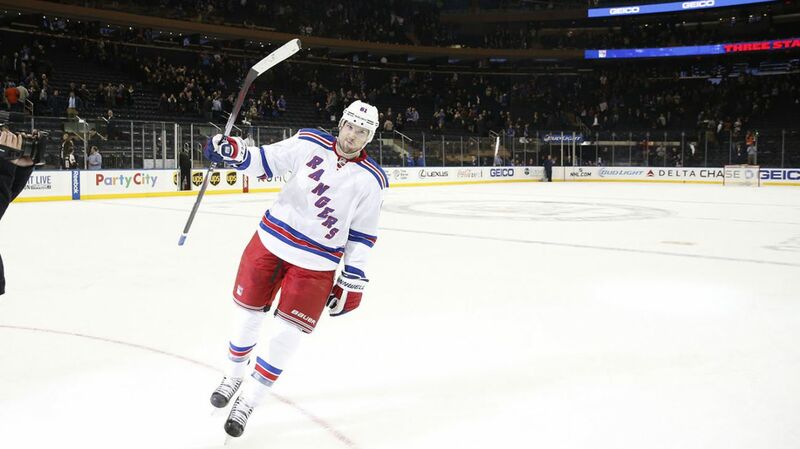 Stepan has helped the power play improve, as well as giving the Rangers another top-six center they can rely on. 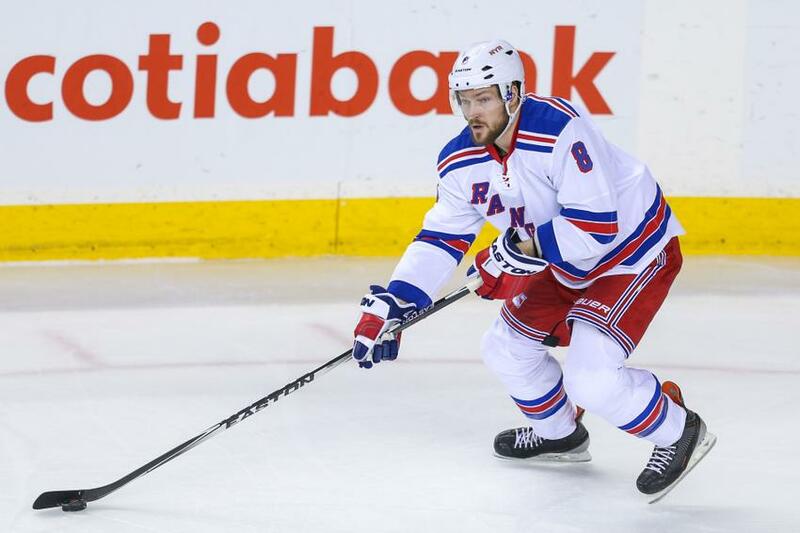 Kevin Klein has been one of the most overlooked Rangers this season. Following the McDonagh injury, Klein has stepped up and provided solid minutes and defensive play for the Rangers. Although he is on the third defensive pairing, he could easily be on the second pairing. Klein has also discovered his offensive ability recently, notching his fourth goal of the season against the Flyers, which matches a career high. Kevin Klein leads Rangers defensemen in goals with four, and is tied for first among defensemen in points with six points. Matt Hunwick and Dan Girardi also have six points. With Carey Price shutting out the Boston Bruins last night, that means that Dustin Tokarski will be in net for the Habs at The Garden. Tokarski started five of the Canadiens games in the Eastern Conference Finals last season, doing a tremendous job of keeping the Rangers at bay. Tokarski is off to a good start this season as the backup for Montreal, with a 3-1-0 record in five appearances, posting a 1.78 GAA and a .937 save percentage. Tokarski has allowed a total of two goals in his last two starts, both coming on the power play. Max Pacioretty leads the Canadiens in goals and points, picking up 18 points (10-8-18) in 22 games. Thomas Plekanec is not far behind, with 17 points (8-9-17) in 22 games. Lee Stempniak is healthy and available to start against Montreal, but it is not clear whether or not Vigneault will make any lineup adjustments following a great effort against Philadelphia. The Rangers and the Canadiens will start at 7 PM at Madison Square Garden, and will be televised on MSG Network. Posted on November 23, 2014, in Game Previews and tagged Alain Vigneault, Anthony Duclair, Buffalo Sabres, Carey Price, Carl Hagelin, Chris Kreider, Dan Girardi, Derek Stepan, Derick Brassard, Dominic Moore, Henrik Lundqvist, Jesper Fast, John Moore, Kevin Hayes, Kevin Klein, King Henrik, Madison Square Garden, Marc Staal, Martin St. Louis, Mats Zuccarello, Matt Hunwick, Montreal Canadiens, MSG, New York Rangers, NHL, NHL 2014-2015 Season, NY Rangers, NYR, P.K. Subban, Philadelphia Flyers, Rangers Nation, Rangerstown, Rick Nash, Ryan McDonagh, Tanner Glass, The Duke, The Ranger Zone. Bookmark the permalink. Leave a comment.